Facing the southern sky, Miss Bell’s Room holds court on the southwest corner of the old mansion. 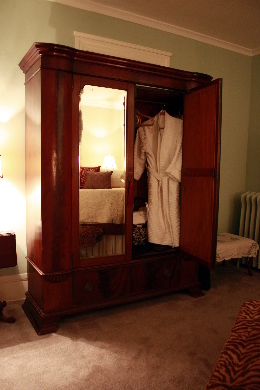 Old meets new with an antique armoire embracing warm robes, slippers and other surprises tucked inside. Watch out, you may need the steps to assist you into bed. The old four poster is tall enough to be the bed in the story,”The Princess and the Pea”! Don’t forget to look out the window the view is spectacular! © 2019 Historic Bell Hill Wedding Venue. All Rights Reserved.